Our Five Ring Circus: Downright Blessed: Meet Ella! In the 2 years since Liam was born, I've had the opportunity to meet some truly incredible people! They are people I never would have met if Liam wasn't diagnosed with Down syndrome. My family was lucky enough to personally meet many of these incredible families, but just as many connections were made online. The Down syndrome community is simply amazing, and my life is fuller with all these wonderful people in it! Shortly after Liam was born, a new friend connected me with the Down Syndrome Diagnosis Network. I was added to a Rockin' Mom Facebook group and met other moms who were new to this journey. I immediately felt like I belonged! Amanda is one of the moms I connected with through the DSDN! Amanda is a former fifth grade teacher, turned stay at home mom. She and her husband live with their beautiful daughter Gabriella aka Ella, in Maryland. She loves to craft and bake, especially specialty sugar cookies for her friends special occasions. She loves reading blogs, and one day hopes to be able to keep up with writing one. Until then, you can likely find her, on preschool days, wandering the aisles at Wegmans or Target. Amanda is here today to share her perspective on raising a child who has Down syndrome! I'm blessed. Not only with a child who has Down syndrome, but to be raising her in a world where our education system values early intervention. She has therapists who know and believe that she can learn, and that she sometimes needs a different path than her peers. We are blessed too that we have social media outlets that allow us in the Down syndrome community to connect just by posting a question to other moms and dads who can help us troubleshoot with connections and suggestions. I must admit, before having a child with Down syndrome, I thought I knew more than your 'average bear' about children with special needs. After all, I have a double major in elementary and special education. I taught in an inclusive classroom. I sat in countless IEP meetings. I saw, brainstormed, and worked through strategies to help students succeed. So when my first child was born with Down syndrome, I thought I had a "leg up". However, I was so entirely wrong. I knew technical pieces of how to support a child with special needs to aid learning. But there is a whole different world of Down syndrome that I had turned a blind eye to. First there were the health factors. Ella was born with a large VSD, a common heart defect among people with Down syndrome, which meant there was no lower wall between the bottom chambers of the heart. This led to many trips to the hospital. Not only were we new to the parent world, we were also new to heart failure symptoms. This led to many worried phone calls to doctors, nurses, and trips to the ER. I remember one night when her heart was in such failure, she refused to eat. She was two months old and I felt defeated. Not only did she not breastfeed, she stopped taking a bottle. We spent Memorial Day weekend in the hospital to put her on a Nasal Gastric tube (NG tube) since it took more energy than she could spare to physically eat by herself. She then had open heart surgery at 3 months old and came home on a nasal cannula providing her oxygen, which we were weaned off of officially in April! After that, Ella had to, and still has to, work hard to continually overcome her hypotonia (muscle weakness that children with Down syndrome are born with). It caused her to crawl late and walk late and still many everyday activities continue to be harder for her because hypotonia doesn't just affect gross movement. Her mouth, her face, her digestion, her vocal cords, etc. all rely upon muscle tone. Another thing you may not know is that everything tends to be smaller in a child with Down syndrome. Her ear canals, sinuses, nasal passages, etc. This leads to more ear infections, sinus infections, and the need to have her tonsils and adenoids removed so she can breath and swallow easier. These are things I managed to not learn about before having a child with Down syndrome. So I completely understand why society is so naive about people with disabilities. We tend to not learn about their specifics. We know the 'label', we know it makes a person different, and we likely can identify a disability based on looks. But beyond that, we haven't spent much time educating ourselves beyond the stereotypes. This is why I'm still a little sore over Down syndrome awareness month. There is only a small percentage of people who are spreading real awareness. Those people likely have a child with Down syndrome. The rest are spreading what they believe are inspirational stories about people with Down syndrome and others in the disability community. They share photos and videos that make society feel good about inclusion: a woman with Down syndrome gets crowned homecoming queen, a man with Down syndrome works a job, a super cute photo of a child with Down syndrome with the title "like if you think she's beautiful", etc. You see, this is fluff, a feel good piece. Our media allows you to feel good about inclusion. A piece we (parents and members of the disability community) want you to stop sharing, because it segregates our children. Your typically developing child can: work a job, be homecoming queen, take a beautiful picture; but ABC 7 doesn't do a story about it on the 6 o'clock news. Certainly my child works hard to overcome indifferences but doesn't yours? Aren't we always struggling with something? Whether it be out in the open or a private, that's what makes us human. I understand my daughter will be different than yours, but isn't your daughter different than your neighbor's daughter? You see we all strive for our children to be valued for their unique differences, but we too, wish for them to be included. But respect and celebrate her differences. But value that expectations look different for each person. But understand that she may last a little longer in baby stages. But remember to celebrate the little milestones she worked so hard to accomplish. But even though my struggles may look different than yours at times, please don't feel sorry for me. I want you to be aware and ask questions, and know that I'd rather you ask questions than to assume based on stereotypes about Down Syndrome. So in this holiday season, while we reflect upon our year and resolve to make changes for next year, I encourage you to take some time to become more aware of others in your community. By making yourself more aware of someone else, understand their differences, and celebrate who they are, we can all begin to see that all our children are more alike than different. Thank you so much for sharing your story and beautiful Ella with us, Amanda! 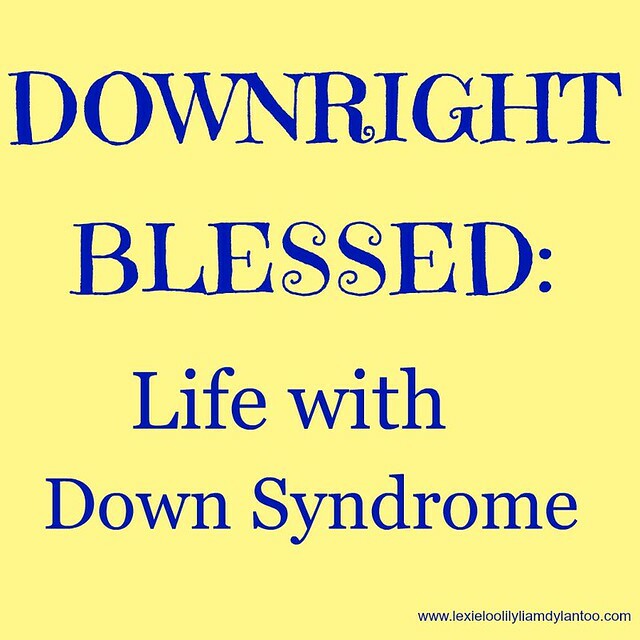 If you're interested in contributing to the Downright Blessed: Life with Down Syndrome series, please send an email to lexieloolilyboodylantoo@yahoo.com. I like that you mention the news stories about the homecoming queens, the jobs, etc. They're nice to read about, but I'm waiting for the day where it's *not* a news story! Great post. It is the differences that make us all richer. Thank you for spreading awareness about Down Syndrome. What a sweet girl! Thanks for sharing her story.